Its nothing really special. This is my back yard. Its a cloudy day and my feeder is set up in the shade of a few willow trees. You will notice that the camera is disconnected from the lens that I was using so I could take this photo with a 35mm lens. There are a few things that I want to point out about my set up. So here is the same image with some numbers. 1. As I have mentioned elsewhere on this site, I use diffusers. The ones pictured are homemade from black foamcore, hot glue, tape and plastic sheeting (drop cloth from Home Depot). 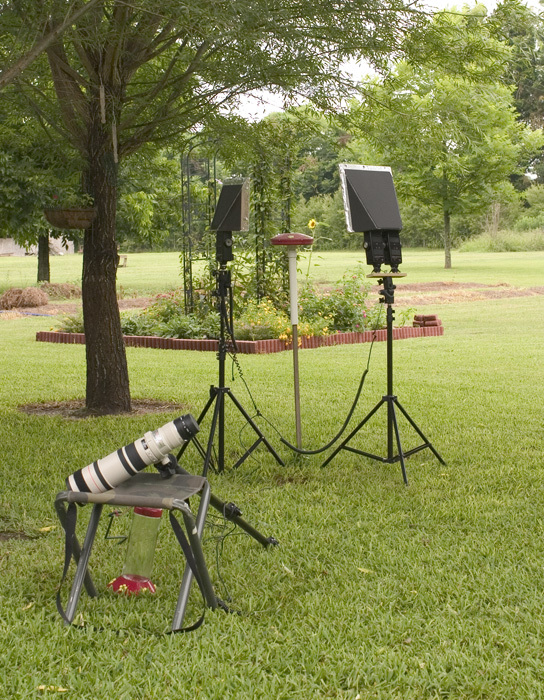 The diffusers sit atop Vivitar 283 flash units. You may notice that on the right, the diffuser is sitting atop two flash units that are mounted on a short board that I made especially for that purpose. 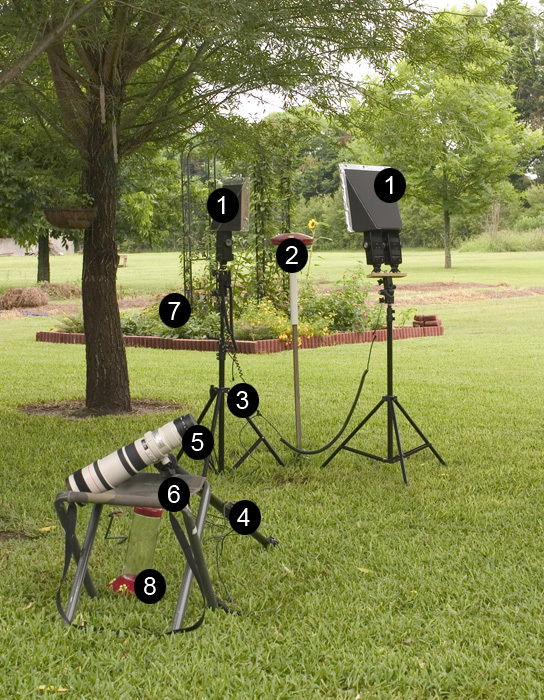 Otherwise, the setup uses standard light stands purchased on EBay for not very much. The diffusers explain the even lighting effect on the bird. 2. I use a flat, saucer-style feeder set to a height just below eye-level when I am seated in the stool. I have cut off the perches because I want photos of flying birds. I have also blocked all but one hole with thumbtacks. Thumbtacks are perfect for the purpose: just drop in when needed and take out when not. The feeder is supported from the bottom to keep the support out of the way. 3. PC-Sync cords for synchronizing the flashes. This eliminates the sometimes bothersome E-TTL pre-flash and allows the use of the relatively cheap Vivitar flash units instead of expensive, dedicated ones. 4. Monopod. This allows me to keep the camera at the ready indefinitely without my arms tiring. It also allows me to keep still. Hummingbirds don't like large things moving near their feeder. 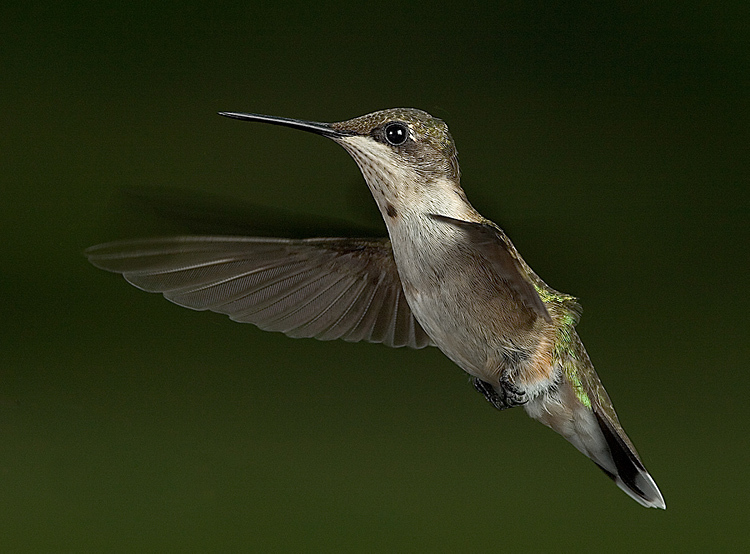 bringing a camera up to your eye when the hummingbird flies into position qualifies as "large things moving" to a hummingbird. 5. 400mm f/5.6 lens with 36mm extension tube attached to allow me to get closer than I could with the same lens and no extension tube. 6. Folding stool given to me by my brother-in-law. It is the perfect height and is more comfortable that it looks. This also helps to allow extended shooting sessions by keeping the photographer from getting tired. It is about 10 feet from the feeder. 7. Hummingbird Garden. Contents: may night salvia; yellow lantana; multi-colored lantana; japanese honeysuckle; clematis; mexican heather; four o'clocks; bee balm; a sunflower; and a butterfly bush. 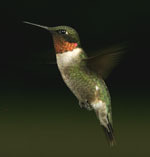 Feeders are great for attracting hummingbirds; feeders and the right plants are better. 8. I took down the other feeder. Hummingbirds will feed far away from you if you give them the chance. For this particular photo I sat and waited approximately 20 minutes before a juvenile male approached. I let it sip a few times before shooting and then took this image. I got one more shot of it before it flew away. The other shot did not turn out well. I waited another 30 minutes before my daughter (11 months old) decided that I should go inside and play with her. So it goes. I used to hide in a blind but find that it is not really necessary. Keeping still is much more important than hiding. Though the blind may help a little, setting it up is really more of a hassle than it is worth, and my blind is easy to set up. Post processing was rather straightforward. I cloned out a bit of the feeder, adjusted the levels and increased the saturation slightly. Then I used Nik Sharpener Pro for "Raw Pre-sharpening," erased the sharpening effect on the background and then resized. Then I used the Epson printer setting of Nik Sharpener Pro for final sharpening. Maybe tomorrow I will see an adult male and get that ruby throat in the image . . .